Ruka, Finland – Winds continued to hamper jumping in Ruka on Saturday, with both Nordic combined and ski jumping schedules being rewritten daily. High winds forced cancellation of Saturday’s opening FIS Nordic Combined World Cup. The qualification and provisional competition round on Friday was also canceled. Officials are looking now at Sunday with a planned 6 a.m. EST jump and 9 a.m. EST cross-country race. 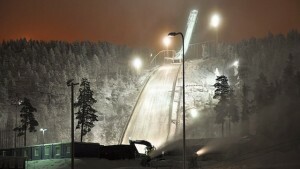 Ski jumping lost qualification and a competition Friday but were still trying to go Saturday evening Ruka time. “We haven’t jumped since Tuesday,” said U.S. Nordic Combined Coach Dave Jarrett.